The name El doble is relevant. 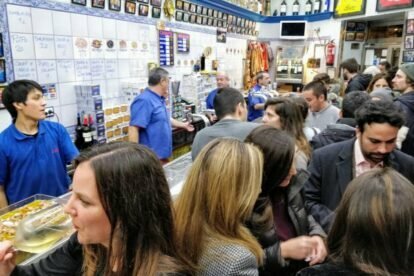 The legend says that this bar serves the best doble in Madrid. A “doble” is the bigger brother of the caña — it’s 330ml. I’ve tasted their beer and I can say it does seem to be better or smoother than other places. Frankly, on the other hand, I don’t know if the beer is better than other places or if it’s all in my mind. In my opinion it just tastes good. Let me know what you think! Old bars in Spain tend to have bright lights, they use LED so forget about enjoying an elegant ambience in this place. This bar has so much light I would even recommend using sunglasses! The staff is a key feature in this type of bar — the old men basically live in the bar and seem to never have a break. If you get to be friends with one of them, you’ll be sure your new best friend will be there waiting for you no matter the day. Many locals come here to have some beers before they go out to a disco, or it might be one of their stops on their night bar hopping tour, so there is a lot of movement. The food is also a strong feature of el Doble but I personally don’t concentrate on it, as it’s a bit expensive for a Spanish wallet. If your wallet can handle it, they have a lot of fresh seafood and alternatives.